Staying in Bali to spend your holiday is great idea because Bali provides everything you need for a memorable vacation. Amongst all popular areas, Ubud is recommended to stay in. You can rent one of Ubud villas that provides you with services and facilities you prefer. Besides, Bali is travel destination that fits any type of traveler. From backpacker to luxury travelers, Bali can give what you want started from perfect accommodation that meets your budgets to stunning attraction you won’t forget. Of course, picturesque view is the highlight of Bali because everywhere you go, you will be presented with stunning landscape of the nature. Villa Awang Awang is a five bedroom-villa located in Melayang Village. This is also a family-friendly villa providing great service and amenities. The best part of staying at this villa is the views of the landscape you can see from the uphill. The majority of villa is designed in traditional Balinese style. There are also some Indonesian antiques decorating interior design. Then, infinity pool is also available for relaxing outside the villa. You can also visit the nearest temple to meditate or just admire the building. Griya Atma is located in the middle of the rice fields, allowing you to enjoy the scenery anytime you want. The majority of this villa is designed in traditional Balinese style but has some modern flairs as accent. This villa features spacious bedroom with private veranda, outdoor rain shower, as well as Jacuzzi and infinity pool. There is also a book library if you feel like reading while enjoying the scenery. Samaki Villa is a three bedrooms-villa in the middle of nature. Staying at this villa, you will feel strong vibe of calmness and serenity. There is stand-alone bungalow overlooking stunning view of the nature. This villa is mostly designed in natural style. It is dominated by wooden materials. The roof is also decorated with alang-alang, a traditional Balinese style. You can relax in a terrazzo bathtub, outdoor garden or infinity pool. Amrita Villa is a three bedrooms-villa surrounded by rainforest and rice fields. This place is perfect to release some stress and recharge your energy with positivity. You can sip your afternoon tea or coffee at the balcony overlooking the view. This villa is located not too far from the center of Ubud. Thus, you still have access to go to important places. There is also tropical garden filled with various plants and flowers outside the villa. 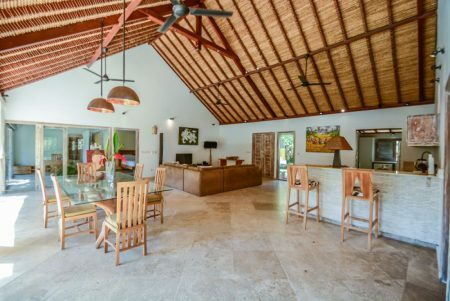 This villa is perfect for solo traveler as well as couples.